Rep. Giffords' District Stunned By Shooting People in Tucson, Ariz., are used to border issues and immigration, but the city has traditionally considered itself a bit immune to the controversy that swirls around the state capitol in Phoenix. So a lot of people are wondering what would make someone hate enough to shoot 20 people. 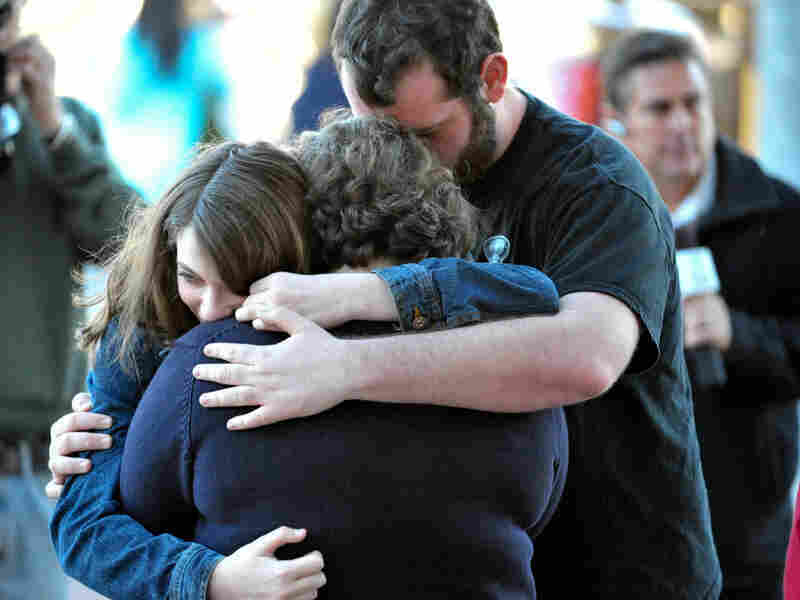 A Tucson family embraces outside Rep. Gabrielle Giffords' office after Saturday's shooting. People in Tucson are used to border issues and immigration, but the city has traditionally considered itself a bit immune to the controversy that swirls around the state capitol in Phoenix. After the shooting last Saturday of Rep. Gabrielle Giffords and others, many people are wondering what would make someone hate enough to shoot 20 people. Pima County Sheriff Clarence Dupnik thinks he knows, at least in part. Dupnik, a Democrat, blames right-wing talk radio, TV and Internet activity for fomenting anti-government sentiment. "The rhetoric about hatred, about mistrust of government, about paranoia of how government operates, has impact on people, especially who are unbalanced personalities to begin with," he says. Dupnik also opposes Arizona's lenient gun laws: It's one of only three states that allow concealed weapons without permits or training. "I have never been a proponent of letting everybody in this state carry weapons under any circumstances that they want," Dupnik says. "And that's almost where we are." But some of Gabrielle Giffords' constituents at a Starbucks next to a supermarket much like the one where the attack occurred weren't so sure that mattered. "I just don't see that contributing to the incident," says Al Chesser, a retired Tucson police officer. "This is an individual that would have found a way to do harm one way or another." Chesser is a Republican who likes Giffords personally, but he voted for her opponent last fall, Tea Party Republican Jesse Kelly. Giffords barely won the election for a third term in this swing district, with land along the border and pockets of deep conservatism but most of its population in more moderate Tucson. But what does the attack mean; what does it say about Tucson? "Well, I really don't think it says anything about the district or about Arizona," Chesser says. "It's not an isolated incident ... how often do we turn on the evening news and find a similar story?" That said, Chesser is not discounting what happened. "People all over here are still reeling from this," he says. "This guy probably would have done the same thing if he'd lived in Colorado or New Jersey." Maybe. But right now, Arizona is the topic of endless commentary and criticism. "I think obviously it can happen anywhere and it does," says Corey Ferrugia, who sat in Starbucks reading a self-help business book on manifesting positive things in your life. "It's a really, really sad thing for me, I'm a Tucson native, and you know to see this even on national news it's been very, very sad," he says. Ferrugia co-owns a fledgling music school. He's a registered independent who met and voted for Giffords. Yet he agrees the attack says little about Tucson. He just can't believe it happened here. "It's a very close-to-home feeling," Ferrugia says. "If anything it's just shock in probably the most humbling way." The shooting may affect politics here, depending on Giffords' prognosis. She is still in critical condition, on a ventilator and in a medically induced coma at University Medical Center in Tucson. Her doctors say she is alive largely because she underwent surgery quickly and because the bullet entered and exited only one side of her brain, limiting damage. Chief of Trauma Surgery Dr. Peter Rhee says it's a good sign that she's been responsive to directions before and after surgery. "We'll ask her, 'Show me two fingers.' That takes specific brainpower to do. She was able to give us that and that was enough for us to know that she's alive inside there, that she's not dead," he says. "And that was what gave us so much optimism." Rhee cautioned, though, that Giffords faces many possible complications, including infection. Even if she survives, it could be weeks or months before doctors know the extent of any disabilities.